Bodill Parker’s eyeletting foot presses are designed for customers who need repeatability but not necessarily the capacity for the high volumes provided by an electric eyeletting machine. Our reliable, easy-to-use foot-operated eyelet presses and punches are ideal for smaller quantity finishing and assembly, and perfect for applications where eyelets need to be assembled away from the edge of the material – or in thicker, tougher materials. 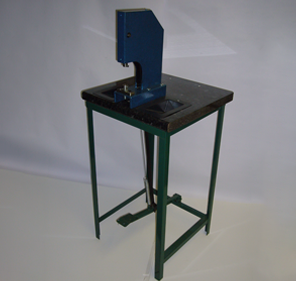 We manufacture and supply foot presses to fit all Bodill Parker eyelets and rings – both standard and custom sizes.